Our H Licence Training courses are run over 2 days with qualified instructors in Northants (UK) followed by your test with a DVLA Examiner, which is organised by Tanks Alot. The course starts with a presentation on the highway code. 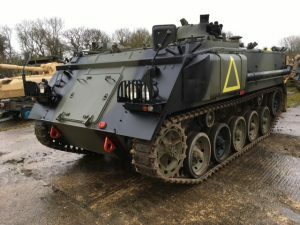 You will then take control of the 432 APC with the instructor, around the test grounds learning more about controlling a tracked vehicle on the road. You will spend time practising for your exam with mock tests and reviews with the instructor until your actual test with the DVLA Examiner. Our H Licence training customers include BAE Systems, the Ministry Of Defence and the Metropolitan Police Force. To drive a particular type of vehicle, you need an ‘entitlement’ for that category on your driving licence. The H category is for Tracked Vehicles such as tanks. This is often referred to as simply “The H Licence”. For all other categories you need the correct full licence to drive the tractor or special vehicle on the road. Driving a tank is not as difficult as you think. However the very nature of such vehicles means proper training is essential. Our courses are thorough and involve one to one tuition at our site or on your premises – in your vehicle or one of ours. Tanks ALot can provide professional tuition for would be tank drivers. From basic “Off Highway” training to the DSA “H”License standard which allows you to drive an appropriately registered and licensed tracked vehicle on the public highway. We regularly train individuals who have bought tanks as collectors items and can arrange bespoke courses for a wide variety of customer requirements including training specialist hauliers who have to load and unload tanks in often awkward places. We also have a large stock of tracked vehicles you can buy after passing your test!